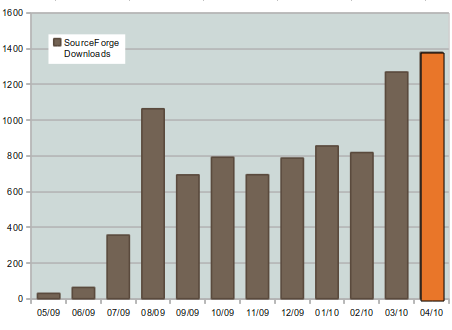 SOFA Statistics is growing in popularity, if SourceForge downloads are any indication. Of course it is early days yet for the project, with version 1.0 not expected until later this year, but current trends are encouraging. It seems there is a gap in the market for an open source statistics, analysis, and reporting package aimed at non-specialist statisticians. This entry was posted on Saturday, May 1st, 2010 at 12:01 am and is filed under general. You can follow any responses to this entry through the RSS 2.0 feed. Both comments and pings are currently closed. The graph appears to be a preview of the charting module in sofastatistics.